The Montana House and the Glacier National Park Fund are pleased to co-host another in the series of “Look, Listen & Learn” programs. Sumio Harada is the featured photographer on Saturday, May 26, 2012. Harada will present his photos at 11:00 am and again at 1:00 pm. 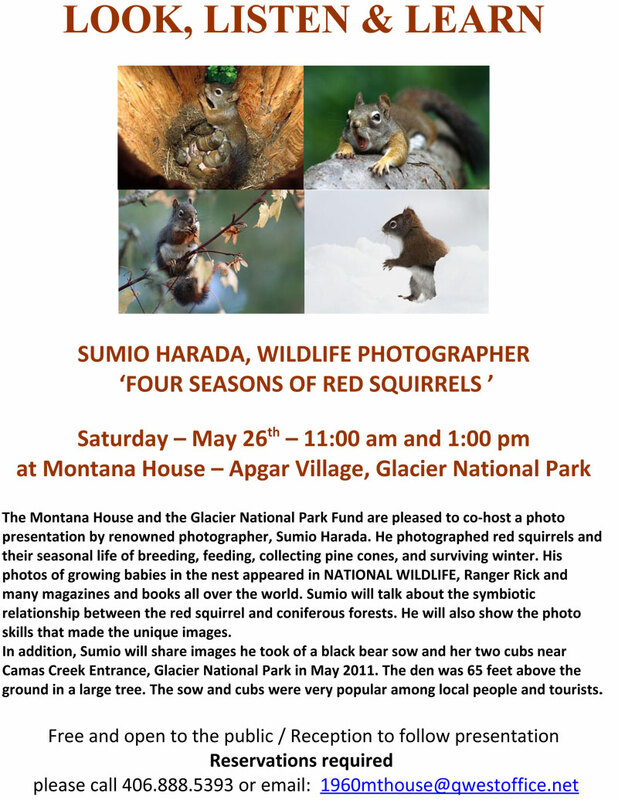 He will share his images of the seasonal life of red squirrels and talk about the symbiotic relationship between red squirrels and coniferous forests. In addition, he will show photos he took in May 2011 of a black bear sow and her two cubs emerging from their den in a large tree 65 feet above the ground. The sow and cubs were very popular among local people and tourists. Sumio is a renowned photographer known for his stunning images of wildlife and landscapes in the Rocky Mountains of the United States and Canada. 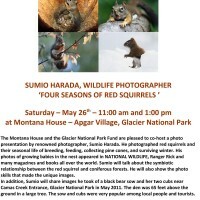 Sumio’s work has been featured in several magazines including National Geographic, National Wildlife, Ranger Rick, Canadian Wildlife and Montana Magazine. His photo book Mountain Goats of Glacier National Park , DVD Collection The Breaths of Glacier, and many of his images are available for purchase at the Montana House in Apgar.